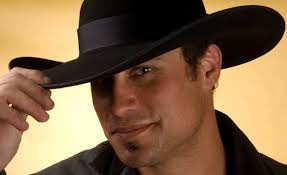 RF – *Chews her bottom lip for a moment* I can’t tell you much more than I accompany Ty to a dance, but as usual, he gets my dander up there, too. What happens from then on, you’ll have to find out for yourself. I may look young and naïve, but I’m not silly enough to give away the whole story. Miz Ginger is counting on sales to help pay for something called an implant. I wouldn’t want to let her down. RF – Oh, yeah. 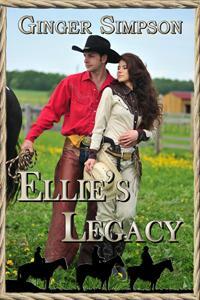 I almost forgot to tell you that Ellie’s Legacy is available on Amazon, published by Books We Love. I reckon the copies are available on something called the Innernet. *pulls paper from pocket. * Miz Ginger gave me this to read: www dot amazon dot com a slash leaning forward author one of those and then gingersimpson. It’s her page where you can see all her books. I hope I got that right. No, she's not a cowgirl or a rancher. This woman was a pioneer of a different type, one who made history for women and the world. Nellie Bly was the pen name of American journalist Elizabeth Jane Cochrane. She was a ground-breaking reporter known for a record-breaking trip around the world in 72 days, in emulation of Jules Verne's fictional character Phileas Fogg, and an exposé in which she faked insanity to study a mental institution from within. She was a pioneer in her field, and launched a new kind of investigative journalism. In addition to her writing, she also was an industrialist, inventor, and charity worker. At birth she was named Elizabeth Jane Cochran. She was born in "Cochran Mills", today part of the Pittsburgh suburb of Burrell Township, Armstrong County, Pennsylvania, the daughter of Mary Jane and Michael Cochran. 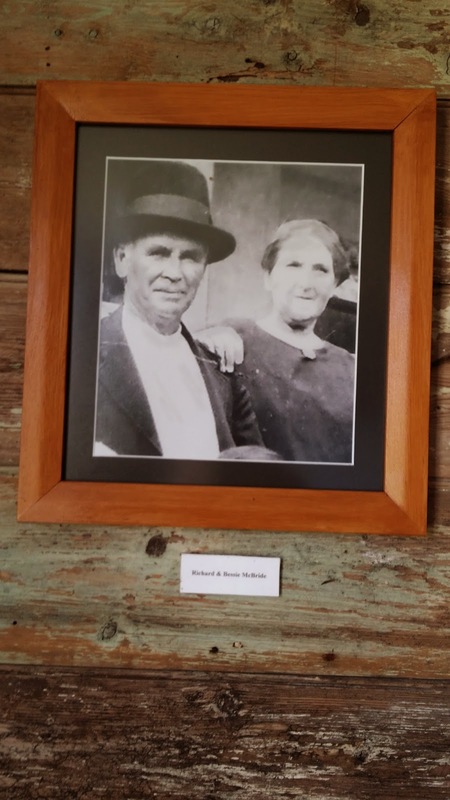 Her father was a modest laborer and mill worker who taught his young children a cogent lesson about the virtues of hard work and determination, buying the local mill and most of the land surrounding his family farmhouse. As a young girl Elizabeth often was called "Pinky" because she so frequently wore the color. As she became a teenager she wanted to portray herself as more sophisticated, and so dropped the nickname and changed her surname to Cochrane. She attended boarding school for one term, but was forced to drop out due to lack of funds. In 1880, Cochrane and her family moved to Pittsburgh. An aggressively misogynistic column entitled "What Girls Are Good For" in the Pittsburgh Dispatch prompted her to write a fiery rebuttal to the editor under the pseudonym "Lonely Orphan Girl". The editor, George Madden, was impressed with her passion and ran an advertisement asking the author to identify herself. When Cochrane introduced herself to the editor, he offered her the opportunity to write a piece for the newspaper, again under the pseudonym "Lonely Orphan Girl". After her first article for the Dispatch, entitled "The Girl Puzzle", Madden was impressed again and offered her a full-time job. 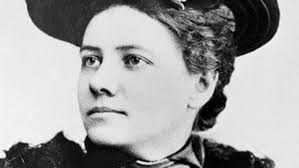 Women who were newspaper writers at that time customarily used pen names, and for Cochrane the editor chose "Nellie Bly", adopted from the title character in the popular song "Nelly Bly" by Stephen Foster. 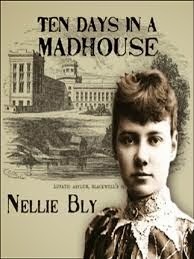 She originally intended for her pseudonym to be "Nelly Bly," but her editor wrote "Nellie" by mistake, and the error stuck. As a writer, Bly focused her early work for the Dispatch on the plight of working women, writing a series of investigative articles on women who were factory workers, but editorial pressure pushed her to the so-called "women's pages" to cover fashion, society, and gardening, the usual role for women journalists of the day. Dissatisfied with these duties, she took the initiative and traveled to Mexico to serve as a foreign correspondent. Still only 21, she spent nearly half a year reporting the lives and customs of the Mexican people. Her dispatches later were published in book form as Six Months in Mexico. In one report, she protested the imprisonment of a local journalist for criticizing the Mexican government, then a dictatorship under Porfirio Díaz. When Mexican authorities learned of Bly's report, they threatened her with arrest, prompting her to leave the country. Safely home, she denounced Díaz as a tyrannical czar suppressing the Mexican people and controlling the press. Burdened again with theater and arts reporting, Bly left the Pittsburgh Dispatch in 1887 for New York City. Penniless after four months, she talked her way into the offices of Joseph Pulitzer's newspaper, the New York World, and took an undercover assignment for which she agreed to feign insanity to investigate reports of brutality and neglect at the Women's Lunatic Asylum on Blackwell's Island. After a night of practicing deranged expressions in front of a mirror, she checked into a boardinghouse. She refused to go to bed, telling the boarders that she was afraid of them and that they looked crazy. They soon decided that she was crazy, and the next morning summoned the police. Taken to a courtroom, she pretended to have amnesia. The judge concluded she had been drugged. She was then examined by several doctors, all of whom declared her to be insane. "Positively demented," said one, "I consider it a hopeless case. She needs to be put where someone will take care of her." The head of the insane pavilion at Bellevue Hospital pronounced her "undoubtedly insane". The case of the pretty crazy girl attracted media attention. "Who Is This Insane Girl?" asked the New York Sun. The New York Times wrote of the "mysterious waif" with the "wild, hunted look in her eyes", and her desperate cry: "I can't remember I can't remember." Committed to the asylum, Bly experienced its conditions firsthand. The food consisted of gruel broth, spoiled beef, bread that was little more than dried dough, and dirty undrinkable water. The dangerous patients were tied together with ropes. The patients were made to sit for much of each day on hard benches with scant protection from the cold. Waste was all around the eating places. Rats crawled all around the hospital. The bathwater was frigid, and buckets of it were poured over their heads. The nurses were obnoxious and abusive, telling the patients to shut up, and beating them if they did not. Speaking with her fellow patients, Bly was convinced that some were as sane as she was. On the effect of her experiences, she wrote: "What, excepting torture, would produce insanity quicker than this treatment? Here is a class of women sent to be cured. I would like the expert physicians who are condemning me for my action, which has proven their ability, to take a perfectly sane and healthy woman, shut her up and make her sit from 6 a.m. until 8 p.m. on straight-back benches, do not allow her to talk or move during these hours, give her no reading and let her know nothing of the world or its doings, give her bad food and harsh treatment, and see how long it will take to make her insane. Two months would make her a mental and physical wreck." …My teeth chattered and my limbs were …numb with cold. Suddenly, I got three buckets of ice-cold water…one in my eyes, nose and mouth. After ten days, Bly was released from the asylum at the New York World's behest. Her report, later published in book form as Ten Days in a Mad-House, caused a sensation and brought her lasting fame. While embarrassed physicians and staff fumbled to explain how so many professionals had been fooled, a grand jury launched its own investigation into conditions at the asylum, inviting Bly to assist. The jury's report recommended the changes she had proposed, and its call for increased funds for care of the insane prompted an $850,000 increase in the budget of the Department of Public Charities and Corrections. They also made sure that future examinations were more thorough so that only the seriously ill went to the asylum. In 1888, Bly suggested to her editor at the New York World that she take a trip around the world, attempting to turn Jules Verne's fictional Around the World in Eighty Days into fact for the first time. A year later, at 9:40 a.m. on November 14, 1889, and with two days' notice, she boarded the Augusta Victoria, a steamer of the Hamburg America Line, and began her 24,899-mile journey. She brought with her the dress she was wearing, a sturdy overcoat, several changes of underwear, and a small travel bag carrying her toiletry essentials. She carried most of her money (£200 in English bank notes and gold in total, as well as some American currency) in a bag tied around her neck. During her travels around the world, Bly went through England, France (where she met Jules Verne in Amiens), Brindisi, the Suez Canal, Colombo (Ceylon), the Straits Settlements of Penang and Singapore, Hong Kong, and Japan. The development of efficient submarine cable networks and the electric telegraph allowed Bly to send short progress reports, although longer dispatches had to travel by regular post and thus, often were delayed by several weeks. Bly travelled using steamships and the existing railroad systems, which caused occasional setbacks, particularly on the Asian leg of her race. During these stops, she visited a leper colony in China. In Singapore, she bought a monkey. As a result of rough weather on her Pacific crossing, she arrived in San Francisco on the White Star Line ship Oceanic on January 21, two days behind schedule. New York World owner Pulitzer chartered a private train to bring her home. She arrived back in New Jersey on January 25, 1890, at 3:51 p.m.
Just over seventy-two days after her departure from Hoboken, Bly was back in New York. She had circumnavigated the globe, traveling alone for almost the entire journey. Bisland was, at the time, still crossing the Atlantic, only to arrive in New York four and a half days later. Bisland also had missed a connection and had to board a slow, old ship (the Bothina) in the place of a fast ship (Etruria). Bly's journey was a world record, although it was bettered a few months later by George Francis Train, who completed the journey in 67 days. 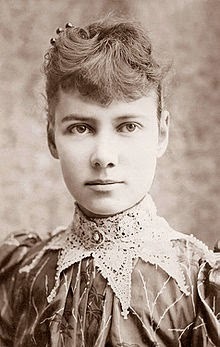 In 1895 Nellie Bly married millionaire manufacturer Robert Seaman. Bly was 31 and Seaman was 73 when they married. 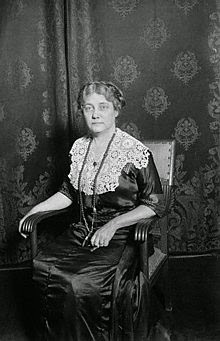 She retired from journalism, and became the president of the Iron Clad Manufacturing Co., which made steel containers such as milk cans and boilers. In 1904, her husband died. In the same year, Iron Clad began manufacturing the steel barrel that was the model for the 55-gallon oil drum still in widespread use in the United States. Although there have been claims that Nellie Bly invented the barrel, the inventor is believed to have been Henry Wehrhahn, who likely assigned his invention to her. Nellie Bly was, however, an inventor in her own right, receiving US patent 697,553 for a novel milk can and US patent 703,711 for a stacking garbage can, both under her married name of Elizabeth Cochrane Seaman. For a time she was one of the leading women industrialists in the United States, but embezzlement by employees led her into bankruptcy. How sad that such an innovative and intelligent woman was the victim of unscrupulous employees. Back in reporting, she wrote stories on Europe's Eastern Front during World War I and notably covered the Woman Suffrage Parade of 1913. Her headline for the Parade story was “Suffragists Are Men's Superiors”, but she also "with uncanny prescience" predicted in the story that it would be 1920 before women would win the vote. She was inducted into the National Women's Hall of Fame in 1898. 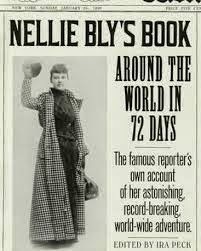 The remarkable Nellie Bly died of pneumonia at St. Mark's Hospital in New York City in 1922, at age 57. She was interred in a modest grave at Woodlawn Cemetery in the Bronx. This month's topic is: What is your favorite time and place to read? How about writing time? Do you have to make time? Do you have a ritual or is your plan helter-skelter? I had a quilting teacher who followed the Swiss-cheese method to completing tasks: Make a hole here, and sometime later a hole there; keep repeating this until the whole thing is complete. What's your method? Well,I guess I'll be honest. My retired life is "helter-skelter" when it come to anything. When I worked, I lived on a schedule and was organized. In fact, I wrote my debut novel during my lunch hours and breaks. As a retired person, I stay up late, sleep in, and don't have a scheduled time for anything. My reading and writing time has suffered because I spend far too much time on social media because I miss my friends, and for whatever reason, my characters seem to sense my disorganization and don't speak to me as often as they often used too. Right now, I have visitors through the winter, and I'm trying to change my life style by adding exercise and altering my diet. I guess I've made my health a priority, and that's a good thing, but I often think I need to find another job so I can get myself organized again. 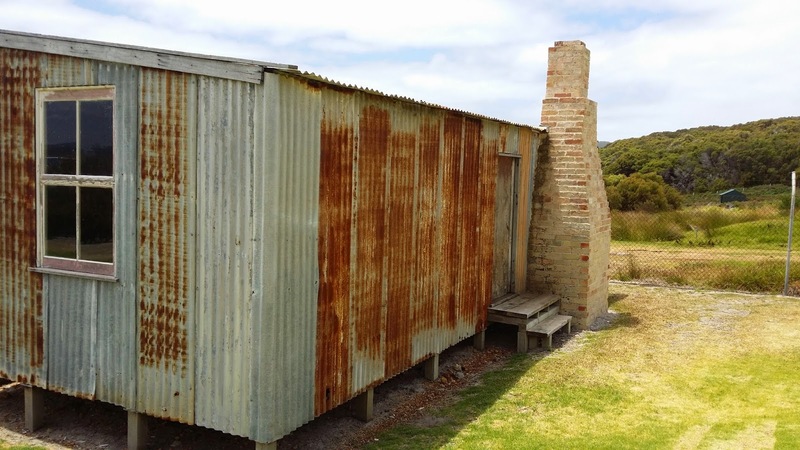 Whaling was Albany's (and Australia's) oldest industry. Well before official settlement took place our shores were visited by British, French and then American whalers. Many ships, which brought out the convicts to this country in its early days, were whale chasers, which would unload their human cargo and then carry on whaling. This arrangement worked well as there was no other cargo available in those days for the return trip. It was the presence of French warships, which followed their whalers into this area, that lead to Major Edmund Lockyer being sent to found the first permanent settlement on the western half of the continent. The settlement was first called Frederickstown but was later renamed Albany. It is interesting to note that the ship that brought Lockyer and his party to Albany later became a whale chaser. Soon after official settlement in 1826, some of the settlers took up the arduous but lucrative trade and set up bay whaling stations at a few sheltered beaches, mainly to the east of the town. Albany itself prospered from trade with these early whalers and with visiting ships, although many of these avoided the port itself and pulled into Two People's Bay and elsewhere to avoid paying harbour dues. Old whaling reached a peak around 1845 when these were approximately 300 whale ships (mostly American) and numerous shore stations operating along the South Coast of Australia. The numbers declined rapidly after 1859 when petroleum oil was discovered in Pennsylvania with only a handful remaining after the turn of the century. Men no longer had to spend up to four years at a time at sea and risk their lives almost everyday to provide oil for the world's lamps. All they had to do now was to drill a hole into the ground. 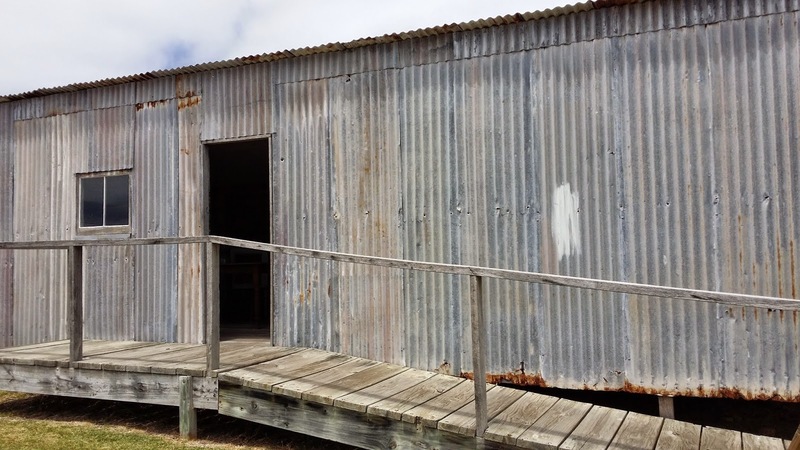 In 1912 a Norwegian company obtained a license from the Western Australian Government and operated from both Frenchman Bay near the current Historic Whaling Station site and Point Cloates off the west coast. They did quite well for a few years with the then quite modern steam whale chasers fitted with harpoon guns, but after a poor season in 1916 and with the pressures of the first world war both here and at home they decided to leave. One of the early whalers was a man by the name of William McBride. It's believed he was born in Arlington, Massachusetts in 1840 and fought for the Union in the Navy. After the war, due to disagreement with his family as they were confederate supporters, he sailed to Albany and enlisted on as a whaler. It was a job he had done out of New Bedford on the 350 ton whaler - 'George and Susan'. He met and married his wife - a local girl, Lucy, in 1871. She bore him eight children before she died in 1887 (probably exhausted). He worked as a whaler, sealer, fisherman and limeburner. He spent many months at a time away from home. (Didn't stop them from having children!) Their eldest son, Richard followed in his father's footsteps. 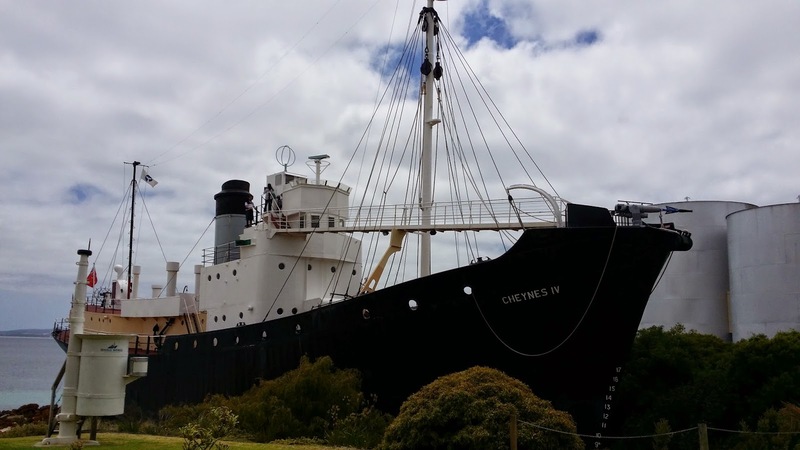 In May 1952 the Cheynes Beach Whaling Company commenced their first year of whaling with a second hand whale chaser obtained from Norway and a small quota of Humpback whales. Humpback whales were the only species to be taken in the first three years of the whaling station's 26 year history and from 1955 the company took both Sperm and Humpback whales. In 1963 the International Whaling Commission put a ban on all Humpback whaling in Australian waters. This was due to the rapid decline in the Humpback whale population. A total international ban was put on Humpback whaling in 1982. The increase in economic pressure was the main reason for the closure of the Cheynes Beach Whaling Company. The station ceased whaling operations and was decommissioned in 1978. Whether you love or hate the industry, it is an interesting time in Australia's past. I, for one, am glad it is gone. The Western Romance genre is strictly American, nowhere else in the world can lay a claim to the “Old West”. Other countries had their wild and rowdy times, but no one else had the vast open land west of the Mississippi—land of promise, change, beauty, wonder and riches. Of course there was also pain, hardship, broken dreams and death. Men had to be bold, women tough. But above all, they had to be willing to gamble. People of all walks of life went west. Rich and poor alike. Single men and women and families. Those with trades and those with nothing more than dreams. And it was one big gamble. Not just with their lives, but with their money and possessions. Though it’s somewhat of a slapstick movie concerning gambling in the old west, I love the move Maverick with James Garner and Mel Gibson. It portrays how acceptable gambling was. As communities formed, some local laws were put into place, but ultimately, gambling wasn’t illegal. It was a much sought after activity and in some instances, the only hope people had. Prostitution wasn’t illegal either, and very few, if any, laws governed guns, alcohol, or drugs. 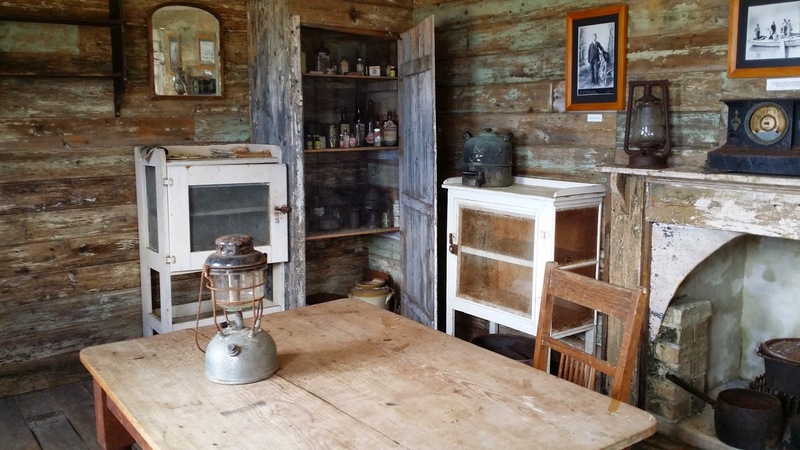 Just like those who set up other businesses—trading posts, hotels, bath houses, blacksmith shops and general stores—those setting up gaming halls were welcomed, especially by groups building churches and schools. Many gambling entrepreneurs were known for their generosity, and community leaders recognized that. Gambling wasn’t any more taboo than riding a horse or wearing a gun. It was a part of life. Not even churches preached against gambling until after the temperament movement. Ultimately, gambling played a huge role in winning the west. Poker was a popular game, mainly stud. The cards consisted of a deck of twenty cards. Ace, King, Queen, Jack and Ten in the four suits. Cards were dealt and there was no drawing for a better hand—that came in later when decks of 52 become more popular. Three Card Monte—three cards were placed face down, quickly shuffled around, and then the player was to choose a specific card. Slight of hand made this game a con man’s dream, and it soon became the one game outlawed. Faro was the most popular game and played in every gambling house. The player played against the dealer in this high card betting game. 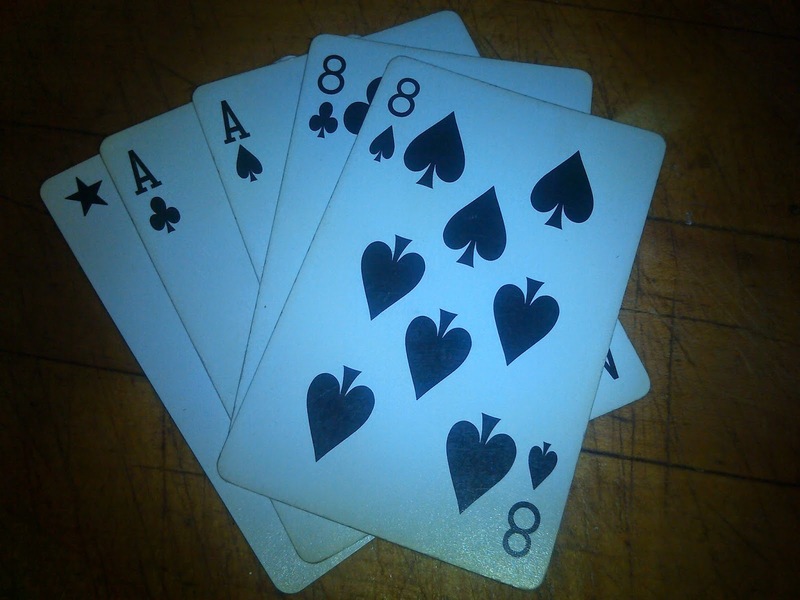 In August of 1876 when Wild Bill Hickok was shot and killed in Deadwood, South Dakota while sitting at a poker table, it is said he was holding a hand that contained two aces and two eights—all black. (The identity of his fifth card varies.) This hand, aces and eights, became known as “Dead Man’s Hand.” In the 1920’s, not during the old west! There was no actual account of what cards Wild Bill was holding at his time of death, or even if he was in the midst of a game. Nonetheless, Wild Bill and his ‘Dead Man’s Hand’ was indicted into the Poker Hall of Fame in 1979. As towns matured, they passed laws concerning gambling, not making it illegal, but on taxing it to pay for other city needs. For many communities, it was taxed into extinction. Labels: aces and eights, Dead Man's Hand, Gambling, Lauri Robinson, Wild Bill HIckok. Many, many years ago -- too many to mention -- when I was about twelve years ago, I sat down with a group of friends, and together we created a "super powerful, absolutely unbreakable" code. At least, that's what we thought. O gsomq Gaw oh jaeppu xysa, wim'g uiy? Confident that no one could read our secrets no matter how hard they might try, we filled our diaries, wrote letters to one another, and even memorized a few handy phrases, such as "Piiq ifaj gsaja!" That was often used to alert a member of the group to the presence of a cute boy. Looking back now, I have to laugh at our supposedly unbreakable code. Of course, no one read our secrets because no one really cared. Had anyone wanted to decipher our cryptic messages, it would have been very easy, indeed. In fact, any fan of puzzle-book cryptograms can easily break our code with no more information than what appears in the two example sentences above. Note: If you're not a cryptogram solver, don't worry about what my little messages here are all about. They're truly not worth decoding. What my friends and I were using is known as a simple substitution code in which one letter of the alphabet replaces another. To show how truly naive we were about "secret codes", ours was the weakest variety of substitution code. So much for the brain power of silly 12-year-old school girls! Soon after high school, I discovered magazine cryptograms. At first, I thought solving one must surely be the most difficult thing in the world, but being the curious sort, I set about learning how to unravel them. From there, I went on to learn about many different types of codes and ciphers, many of which are extremely complicated. First, contrary to what many people think, the term code and cipher are not interchangeable. What we referred to as "Our Secret Code" back in sixth grade, was actually not a code, but a cipher. A message written in code is one in which each word is replaced by another word whose meaning is known only by the intended recipient. In similar fashion, many times individuals or places are given code names. During the Kennedy administration, the White House was known to the Secret Service as Camelot. President Kennedy was given the code name Lancelot. A cipher, by contrast, is one in which each individual letter is replaced with another letter or with a symbol. In addition to substitution, popular forms of ciphers are transposition (writing words backward or transposing groups of letters), and "rotations" or "shifts", where letters are replaced by counting down a pre-determined number. A "ROT1" cipher, therefore, would use B forA, C for B, and continue through the alphabet in the same manner. The illustration below shows a "Caesar Shift" coding device based on rotation. The inner wheel could be turned to align with a specific "key letter". For the "ROT1" cipher mentioned above, the letter B would be moved under the letter A in the outer ring. 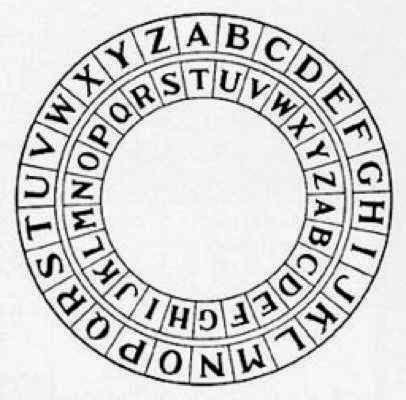 Most rotational ciphers are referred to by the key letter used. If we were exchanging secret documents, we might agree to use a "G" cipher on a certain day, or an "N" cipher the next. A more complex form of cipher is the Vigenere in which multiple transitional ciphers are used within a single message. This is one type of "polyalphabetic" ciphers. Many others exist. Codes and ciphers have played an important part in history, especially during wartime. Even during times of peace, intelligence communities still need secure methods for exchanging private information. Of course, "encryption" is also an important concern for online financial or personal transactions. But what about the wild west? Were codes and ciphers used back then? Most definitely. One of the most fascinating treasure quests involves a still-unsolved cipher. The story is told of a man named Thomas J. Beale who was alleged to have hidden away a treasure worth (in today's figures) about sixty-three million dollars. The treasure is said of have originated from a mine near Santa Fe. 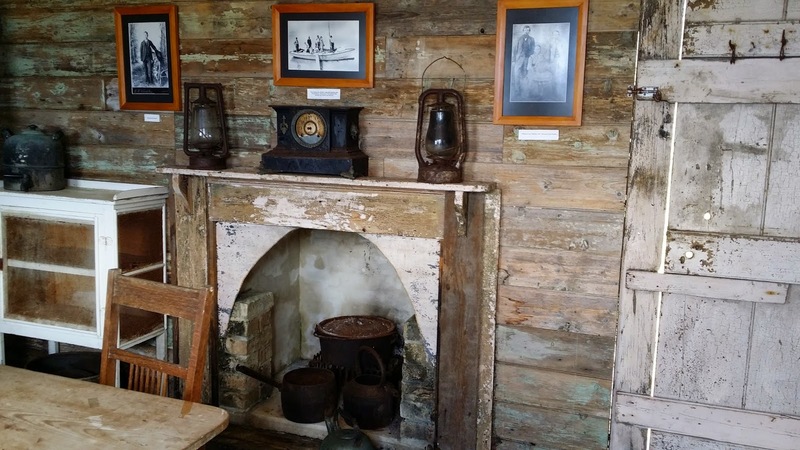 Some versions of the story place the treasure in Colorado; others tell of Beale returning to his home in Virginia to stash the loot. What is known for certain is that Beale encrypted three documents. The first was said to reveal the location of the buried silver and gold. The second provided information on the content of the treasure. The third listed the names and the kin of the treasure's owners. These three documents were placed in an iron box and entrusted to an innkeeper with instructions not to open the box unless Beale failed to return for it within ten years. The box remained unclaimed, and finally, twenty-three years later, the innkeeper opened it. Eventually the second cipher was solved. The content of the first and third ciphers remains a mystery and no one has yet uncovered Beale's treasure...if any treasure existed. There are some who believe the Beale papers were nothing more than an elaborate hoax. Maybe so. There are others who claim to have found the hidden vault and many artifacts, but, alas, no treasure. Although I don't know whether or not Beale's treausre truly exists, I've long been intrigued by the cipher. When I began writing He Loves Me, He Loves Me Not, the third book of my "Sunset" series, I knew my characters would be doing a bit of treasure-hunting of their own. It was a perfect opportunity to share my love for ciphers. The document Ben and Emily set out to decode is a bit less complicated than Beale's cipher. Creating it was great fun, and I hope readers will enjoy the challenge of solving the puzzle. Will it lead to gold? Or only to a lot of trouble? I could go on and on about codes and ciphers, secret writing, and code-breaking. Over the years, it's become a favorite past-time of mine. If I've sparked any curiosity -- and I hope I have -- you might want to pay a visit to the "Braingle" page on Codes, Ciphers, Encryption, and Cryptography. 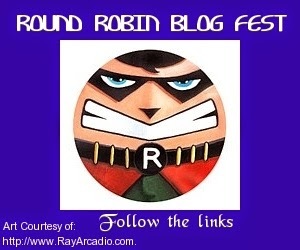 You'll find that I've barely scratched the surface in this post. From "Playfairs" to "Four Squares" to "Book Ciphers" to "Semaphores", there's a lot of hidden messages in the world around us. Book Three of "The Sunset Series"